This boilerplate takes care of all the heavy-lifting needed by dynamic themes in order to set up WebExtension listeners, hooking with other APIs — to let you focus on the dynamic theming part. In this case, the “shady” theme is used at night from 9pm to 9am and on private tabs. In all the other cases, the “bright” default theme is used. Can you guess what this does? Here is a clue: rules have the concept of “priority”, if more than 1 rule matches, the bottom-most rule is used. In this case, the “bright” theme is used during daytime and on private windows during nighttime. The “shady” theme is used during nighttime, and on private windows during daytime. Phew! Later on in this article, I’ll show how you can define your own properties. 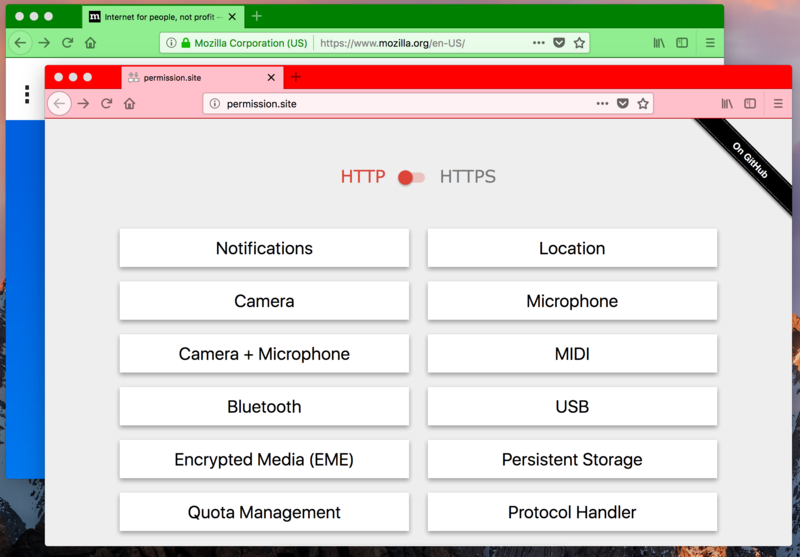 Now that you’ve been introduced to the system, let’s build an useful example: let’s style the browser based on whether the current tab is an HTTP or HTTPS page. …and that’s it! Notice how “bright” was kept as default theme. This is because other protocols like file:// exist, in which case the extension applies a neutral theme. Each property definition takes a WebExtension Tab object (which you can choose to ignore), and returns a value out of it. All of the built-in property definitions can be found in the properties.js file. It can potentially be used to style tabs differently depending on the number of cookies. Whether you need a very simple way to create dynamic themes that doesn’t require deep knowledge in WebExtension APIs, or simply a way to quickly prototype contextual UI features, this is the right tool for you! There are many possibilities using this system, it would be great to see what you can come up with. Here is the repository: https://github.com/nt1m/theming-rules. Feel free to share your experience in comments here, or via Github issues. Mozilla contributor working on Firefox. extremely powerful. I have not seen any app like this before. very fast and easy. thanks greatly for the brain.